A geographic information system (GIS) is a helpful tool for managing and analyzing data to assist in communication, reporting, and understanding of geographic places and phenomena. SHPD uses GIS to assist the review and compliance program by allowing staff and stakeholders to visualize historic properties that may be potentially affected by a number of factors including: development, sea level rise, natural disasters, and other economic and geological processes. The SHPD GIS is also an important tool for education, outreach, and community involvement that can enhance the decision-making of legislators, large landowners, government officials, and community organizations. The overall purpose of GIS is to allow people to tell their story by using a map based on accurate information. SHPD strives to create a GIS that is beneficial to all people of Hawaiʻi, to assist them in telling their story, and give everyone an opportunity to understand the importance of preserving Hawaiʻi’s past for future generations. Over the years, several phases of GIS development have occurred at SHPD in an effort to digitize all historic properties listed in the State Inventory of Historic Places, as well as the National and State Registers. The current iteration of the SHPD geodatabase contains feature classes and attributes that clearly define the eligibility, condition, preservation status, historic context, etc., of each historic site, building, structure, object, and district, according to National Park Service and Federal Geodetic Data Committee standards for geospatial data under the Cultural Resources theme. 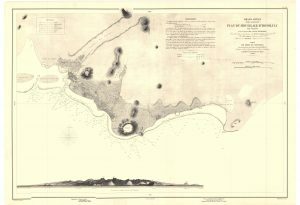 As this dataset is still a work in progress, SHPD encourages you to use the Office of Hawaiian Affair’s Kipuka Database when searching for geographic information concerning historic properties. SHPD’s GIS Specialist is currently working on developing webmaps, feature services, and story maps to soon be hosted on this page. For information on how to submit an SIHP request please refer to the Forms page. SHPD currently uses Esri’s ArcGIS 10.6.1 for mapping projects, Trimble Geo7x for GPS data collection, Trimble Pathfinder for post-processing GPS data, and references all non-cultural layers from the Hawaiʻi Statewide GIS Program, please follow this link to download and access all current State data. For any questions or comments about SHPD’s GIS program please contact the GIS Specialist at Michael.A.Wahl@hawaii.gov.